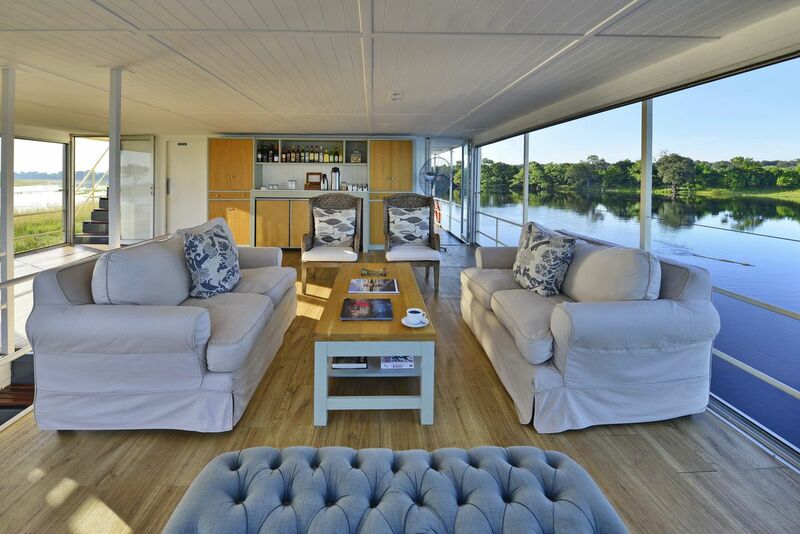 Looking for something different on your safari - try a safari houseboat. 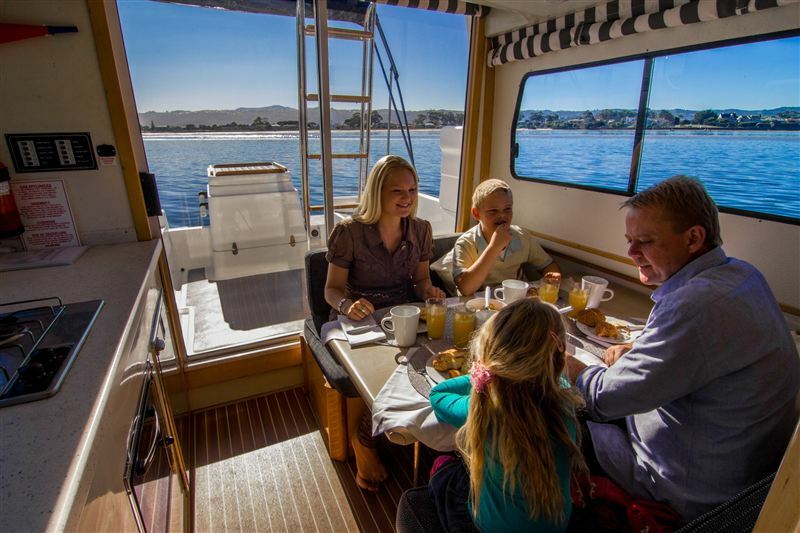 We have a selection of houseboats in a range of locations - whether you are a couple, a family or a small group. Safari Houseboats have become increasingly popular as part of an African safari itinerary, mostly in southern Africa (Botswana, Namibia, Zimbabwe and South Africa). They offer a complete contrast to your usual safari camp or lodge - a houseboat is a complete change of scene - from land to water. Imagine waking up to stunning water views every morning, cooling breezes and game viewing by boat while sitting back and enjoying outstanding hospitality as you relax and soak up the scene before you. To help in selecting a suitable houseboat for you we would need to consider how it fits into your itinerary, time of year and budget. If you are considering a safari houseboat mention this in the Start Planning form at the bottom of the page and we will be pleased to offer our recommendations. Located on the far north of Botswana, on the border with Namibia, lies the great Chobe River. 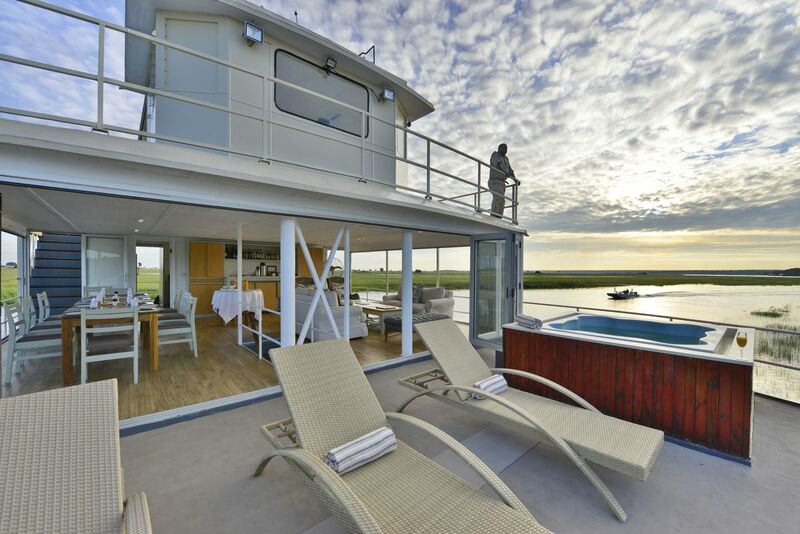 Here you can cruise its waters aboard a luxury houseboat (either in Botswana or Namibia). Located in Northern Botswana, alongside Namibia’s Caprivi Strip, Chobe National Park is the second largest National Park in Botswana with the largest concentration of game on the African continent. The Chobe River, forming the northern boundary of the park, originates in the highlands of Angola. From there, it winds its way into the Zambezi River, which eventually flows into Victoria Falls, through Mozambique and into the Indian Ocean. Because it crosses floodplains, forests and open woodlands, the Chobe consists of a complex network of channels and marshes, which makes for spectacular game viewing due to the lush vegetation that surrounds it. While it has water all year round, the Chobe rises significantly from February to May, after the rains in Angola that start in November. Strictly speaking a dam, Lake Kariba is situated halfway along the mighty Zambezi River and 90 kms downstream of the magnificent Victoria Falls. The Kariba dam wall was designed by the French Engineer and Inventor Andre Coyne, & built by the Italians between 1955 & 1959. At the time of filling, in 1960, it created the largest man-made lake in the world and still remains the largest by water volume. After a few hours of relaxing cruising aboard the main vessel, the boat will moor in a stunning Bay and allow time for exploring of the surrounds by smaller tender boats. Activities such as water-­‐based game viewing, allows for a great opportunity to experience the enormous diversity of wildlife and get that little bit closer. The relatively untouched bush and its variety of inhabitants provides for a photographers paradise. Stunning hues in the horizon synonymous with the surrounding majestic hills, unbeatable light striking bush colours and wild subjects all make for unique photo opportunities. Try your hand at fishing in these vast waters for a variety of fish species including the common and delicious Talapia Bream, caught on simple worm and hooks method, to the ferocious Tiger Fish which provide an adrenaline filled fight to land in the boat. Matusadona National Park is one of several protected wildlife areas with shorelines on Lake Kariba. Some 338,000 acres (1370 km²) in area, it is bounded on the west by the Ume river and on the east by the Sanyati River. Two-­‐thirds of it lies south of the Zambezi Escarpment formed by the 600 m high Matusadona Range from which it takes its name. Matusadona boasts a unique combination of pristine and rugged wilderness, together with the water frontage of Lake Kariba. Together with its renowned sunsets, there is abundant birdlife and many more mammals ranging from impala to elephant along its shoreline. 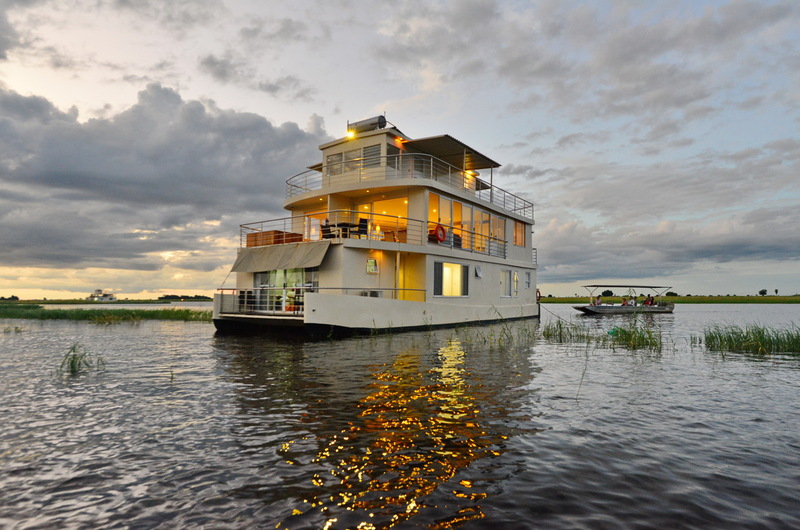 Experience the quintessential Okavango Delta sleeping on board a floating houseboat. Experience the rhythms of the Delta - the gentle lull of the river, the rise and fall of the sun, the haunting cry of the fish eagle and cheerful grunting of the hippo. Our boats are moored on the main channel of the Okavango river, near the village of Seronga, in an area that offers fantastic fishing, papyrus beds and charming palm islands. With the main channel being deep and fast-flowing it is ideal for both the fighting Tiger fish and bream. Seventeen species of fish can be caught in the Panhandle area. Bird watching is also outstanding in the region’s tall, shady, riverine forests and many resident and migratory birds can be seen along the river. Although relaxing on board would satisfy many, excursions on tender boats are arranged to explore the Delta’s countless water channels, with fishing and birdwatching as well as mokoro excursions, overnight camping trips, fishing and village tours. 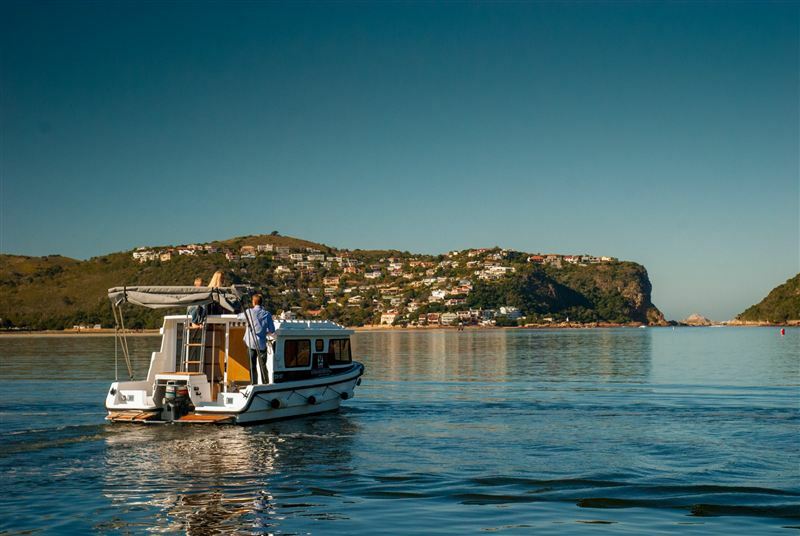 We offer a number of self-catering houseboats on the Knysna Lagoon, south of Plettenburg Bay on thye Garden Route. They are your floating home away from home and have been outfitted to a high specification for a truly comfortable experience. These luxurious self-drive boats have everything you might need and are suitable for up to 4 adults or a family of 5.